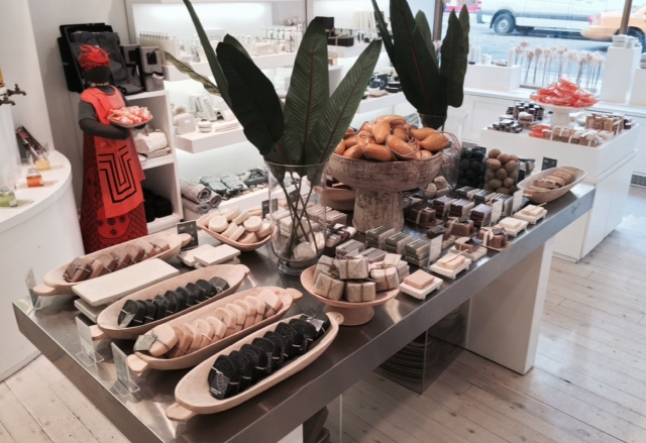 Rain Africa is a skin care store on 49th & 6th which specializes in hand made skin products (from soap to shampoo to creams) from South Africa; using extracts and oils from plants, nuts and fruits, they not only bring fine products to help New Yorkers protect and replenish their skin, but in the process of doing so have impacted the lives of South Africans by providing jobs, skills and hope to those living in desperate poverty, particularly women and the disabled. Best of all once you step in to their NYC store you can feel the love and pride carried out through each and every one of their remarkable products. I had the pleasure of interviewing Hendrien Dewhurst , the owner of RAIN in NYC exclusively for the readers of Yogi Times. Anna Stathopoulou for Yogi Times: Were you always into natural products and lifestyle and what led you to such a life? Hendrien Dewhurst: I grew up in in small town in South Africa, in a remote sheep farming area and, almost by default, lived a very natural lifestyle. So, I am always inclined to go with a natural solution whenever I can. AS: What inspired you to turn it into a business? Hendrien Dewhurst: Bev Missing started Rain 15 years ago with the sole purpose to create work. Along with Bev, my husband Simon and I have had the fortune to grow up in a part of the world rich with beauty and an abundance of natural materials, but also effected by high unemployment. Simon and I got involved with Rain about 6 years ago, attracted by the fact that Rain was a wonderful concept that could use these relatively unknown, wild harvested African oils, extracts and ingredients with a focus on job creation, providing opportunities for local communities and the disadvantaged. We are super proud of the fact that our company is fair trade accredited. AS: What makes Rain unique? Hendrien Dewhurst: The ingredients we use and the focus on providing it in a manner that leaves the smallest possible carbon footprint. At RAIN we do not compromise on quality and believe what you put on your body is equally as important as what you eat. Your skin is your largest body organ and keeping it healthy with the most natural care possible is vital for a healthy life style. As we learn not to put ‘baddies’ into our bodies, equally we should not be putting ‘baddies’ on our bodies. Hendrien Dewhurst: Well you know the saying if you can make it in New York you can make it anywhere - right? AS: What makes this a special place for such a business? Hendrien Dewhurst: New York is an extremely busy city and New Yorkers live at a frantic pace. Rain provides a sense of calmness and an opportunity to create a similar atmosphere in your our home - to relax and restore balance in your life while using products that are good for you. AS: Do you consider your business to be about about products or about lifestyle? Please explain. AS: What challenges do you have in a world where consumers purchase based on brand image or low cost? Hendrien Dewhurst: This is a huge challenge as we are a unknown brand here in the US and we absolutely rely on word of mouth and the experience people have while in the store and the benefit they have experienced using our products. We feel we can be a successful business, by being small, by providing beneficial products and by being exclusive to customers who care about their lifestyle and their health. AS: Could you share with us any particular sotries where your products changed or impacted on of your customers? Hendrien Dewhurst: So many stories. It would be better for me to talk about the ingredients that has been most beneficial to our customers - Aloe Ferox, Baobab, Rosehip oil, Marula, our essential oils, Kalahari melon to name a few. So many stories from customers who have said using products with these ingredients have helped their skins or problems with their skins including a customer who used our Aloe & Avocado Cream and Body Butter to help with the dryness she experience after chemo therapy. AS: Do you have any clients with special conditions like psoriasis or eczema? What product do you usually recommend? Hendrien Dewhurst: We get customers with these conditions all the time however each person is different and we normally recommend they stick to all natural products starting with a natural shampoo, natural olive oil soaps and a natural lotion / cream containing Baobab. When it comes to people who are interested in being more natural and hoiistic minded, what advice do you have for them to get involved into that lifestyle? Hendrien Dewhurst: Read ingredient labels carefully, start one step at a time and make a lifestyle choice.